“We’re all on a journey,” says Gwen Hughes. “I express mine through song.” An Atlanta-based songwriter and singer, she captures the ups and downs of her passage through life, with profound authenticity and revealing honesty on Native Land. Gwen’s journey began when she started piano lessons at the age of five, and years thereafter took to singing after realizing its evocative power. “Though I live in the south, this music is universal,” she says. Music hasn’t just been her mode of expression but also a ticket to the world, performing in dive bars in Macon, Georgia to coffee shops in Istanbul, Turkey. At the same time, Gwen delivers an elegant and commanding tribute to the love song itself: “Native Land" features seven original tunes and four covers  all of which are first class tracks. “I hope that by listening to this album, people remember to be true to themselves,” she affirms. By opening her heart, we hear the melody of a radiant and inspired soul. I Fell in Love begins with a fat, thumpy bass line that sets up a straight ahead, expectant groove. But the lyrics run in another direction, “Took me by surprise, put me on the floor, Right behind the eyes with a two by four.” Gwen reveals how love happens, when you’re looking the other way. One day you’re just living your life, the next you have “burned me up like a chicken in a barbecue.” Gwen covers this Carlene Carter country hit with aplomb. She met Carlene while touring together in a John Mellencamp-Stephen King musical. To celebrate her parents’ anniversary, Gwen wrote These Years as the soundtrack to a retrospective video that was played on the special occasion. She describes the initial recording as “ramshackle,” with the band composed of family members who aren’t professional musicians. But it didn’t matter, because the personal nature of the tune shone through, stirring up heartfelt nostalgia: “These years with you have been the very best,” she sings. Gwen’s parents have since passed away, and she recorded this sweet, short song at the highest quality as a tribute to their example of enduring commitment. Love ain’t easy. When things break down and “we have our doubts,” it’s important to “talk it over” and “find it in our hearts.” In essence, In Our Hearts is a song of reconciliation, a well-chosen tune that expands the range of emotion found on the album. A Bruce Greenwood cover song, Gwen heard the accomplished actor play the song backstage in Bloomington, Indiana and took to it immediately. Watch the Moon is the quintessential life-as-journey song. Gwen wrote it partly out of frustration but also inspiration. “I was waiting for my life to come together,” she remarks. Sometimes life seems to happen quickly for everyone else, but you feel “like the last in line,” as she sings. This cathartic tune expresses disappointment but also holds out hope, “I can be a virgin, I can be a mother.” Gwen’s soaring voice floats over rain drop-like snaps and an introspective guitar accompaniment. “I wanted to write a funk tune,” says Gwen. The Other Side of Lonely is just that: equal parts funk and Motown. The song is decisively upbeat with an affirmative call: “I’ve got a set of legs I can stand on.” No matter how love leaves you  you gotta stand up for yourself. Lyin' Eyes is a unique take on a classic tune. Gwen was in a studio session with Khari Simmons, a neo-soul and accomplished bassist, and they were fiddling around with the song. After reharmonizing it, they realized that they had something special: a darker and jazzier bulwark, over which Gwen could sing the melody. 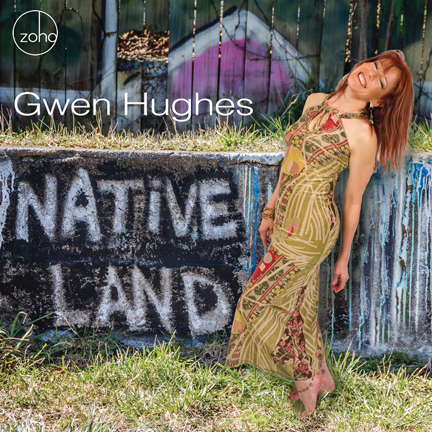 Gwen Hughes - alternate ZOHO CD cover. You On My Mind also came about because of Gwen’s work with Khari, who suggested recording the 1980s Swing Out Sister hit. “I love the groove,” says Gwen. She recasts the song with lush harmonies, measured cadence, and a celestial vocal line. While on tour in Slovenia, Gwen had a heavy heart, missing her husband at home. She looked at the expansive and dark sky, knowing that he could also see the clouds above. Yet in the song Fragile Faith, she inflects doubt by asking, “Are you looking at the same sky? Are you missing me tonight?” By posing these questions, Gwen uncovers her vulnerabilities, giving voice to the underbelly of love. “I’ve never missed anyone, but that night I felt alone,” she says. Because the album is a replete with love songs, Gwen decided to poke some fun at the genre (and herself). In This is a Love Song, she recycles clichés like “You’re the cream of the crop” and “You warm up my night.” By threading together these familiar lines, Gwen weaves a surprisingly fresh and amusing take on that intense feeling of affection found in the archetypical love song. During a trip to Nairobi, Kenya, Gwen visited the slums of Dandora, where she met a young girl who took her by the hand and showed her around. “It was a moving experience, seeing how people with very little material wealth had a strong spiritual life and an optimistic nature.” She wrote Olive Tree after being inspired by that moment. “The tree is a symbol of strength and love,” Gwen says. These eleven tracks are exceptional examples of the craft of composition. Gwen writes stirring lyrics, sets them to well-contoured chord progressions, and brings the words to life with her exquisite voice. It is a joy to listen.